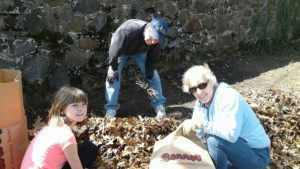 You are here: Home / Varnum House Museum / Varnum House Museum Yard Cleanup a Big Success! 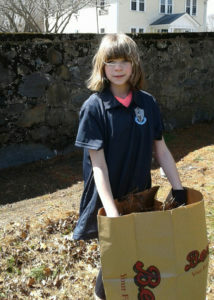 Yard clean up at the Varnum House Museum. 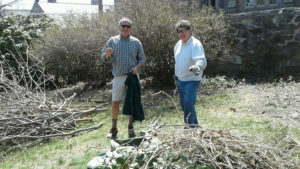 We’d like to thank all the volunteers who came to the Varnum House Museum on April 15, 2017 to help us clean up the grounds and yard perimeter. Between Varnum volunteers and the community service volunteers from CCRI last weekend, the house grounds are really starting to come together! There was lots of work to be done including the cleaning of leaves and yard debris, pruning bushes, limbing up trees, and a lot more. Pitching in to help maintain our historic properties is just one of the rewarding activities that come with Varnum Continentals membership. If you’d like to help out as well, just click here to join the Varnum Continentals.